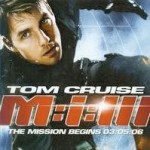 TNT will broadcast the network television premiere of Mission: Impossible III this coming Saturday in HD. M:i:III is the third installment in the Mission Impossible movie series and takes Ethan Hunt on his toughest challenge yet. The premiere is set for Saturday night at 8 PM ET. M:i:III was directed by J. J. Abrams and first released in 2006. It stars Tom Cruise as Ethan Hunt, Michelle Monaghan as his fiancée, Ving Rhames as right hand man Luther Stickel, and Laurence Fishburne as IMF director Theodore Brassell. Ethan’s enemy, Owen Davian, is played by Philip Seymour Hoffman.